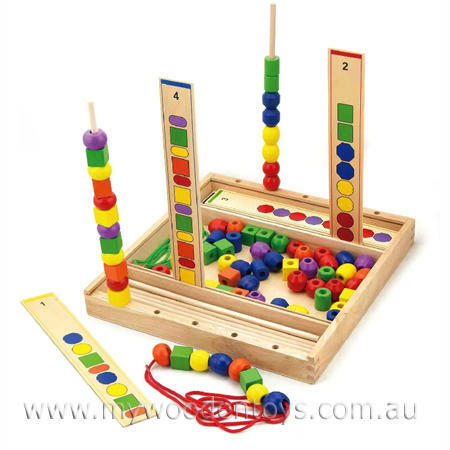 Wooden Bead Sequence Game is a great educational toy which teaches the very important skill of putting events, ideas and objects into a logical order. This set consists of 72 beads, 10 pattern panels, 10 round sticks, and 2 cords. The idea is to stand up a pattern panel and stick and then match the right colour, shape and order. There are also 2 pattern panels which have no colour so for a beginner they only have to match shapes. There is a great deal going on in this set and a myriad of learning possibilities. Sorting and lacing, Colour and shape recognition , counting and many more. Sequencing is a very important skill to learn and one we all use everyday in many different ways without even realising it. We like this because: "Such a fun and important learning tool."